I have another decorated USB flash drive project for you. I’m using washi tape to spiff up a flip around flash drive. This is an easy, quick, and cute way to identify your flip around flash drive from everyone else’s flip around flash drive in school or in my case, the car. Husband and I keep our personal playlists on separate drives in the car. 1. Use the needle nose pliers to open the jump ring to the keychain and remove it, if necessary. Set the keychain aside. We will reattach it later. 2. 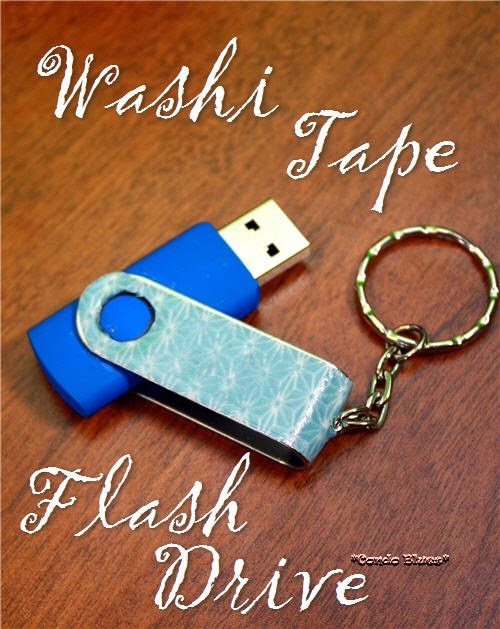 Cut a piece of washi tape the length of the USB drive. 3. Apply a bit of glue to the USB drive swivel and glue the washi tape into place. Tip: Yes, I know it seems wrong to glue tape. I didn’t use white glue on my flash drive the first time I tried decorating it, because tape. The washi peeled off because it is a thin paper tape on a heavy use item. I used a bit of white glue (Mod Podge works too) to encourage the flash drive and washi to be steady friends. it worked. 4. Use the craft knife to make a slit in the washi tape for the keychain loop, trim the tape to fit if needed, and to cut the tape from the swivel on both sides of the storage drive. 5. Carefully cover the washi tape in Dimensional Magic and allow it to dry. Dimensional Magic will protect the thin paper tape from tearing and add a glossy oomph to your decorated storage drive. 6. Reattach the jump ring and keychain the to flash drive with the needle nose pliers. 7. Load it up with files, music, or if you are me, a thousand photos of your best gal, Lacey. Hey, Lisa I have an idea. A USB flash drive loaded with all of your favorite things would make a nice gift for someone!